SIX SETS for the price of FIVE! : Alien Cantina, Cyberpunk Disco, Quasi organic vessel, Running the net, Wormwhole, Cryogenic facility. Everywhere you'd want to go in the best of Sci-Fi Tabletop roleplaying evenings. 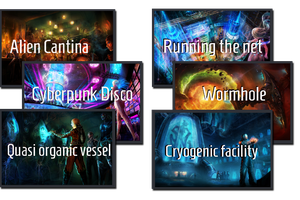 From a certain recognizably 'Star wars' Cantina, a grooving Shadowrun disco, to a disgustingly organic vessel and a cryogenic facility filled with things you hope don't escape (they will, they always do). There's even a beautifully peaceful wormhole and all the sounds you'll need to 'run the net'.